We are proud of our students here at UIS and often, we have the privilege to recognize individual students for their outstanding accomplishments both on and off campus. I had that that opportunity a few days ago when UIS alum Julie Kellner, who is Executive Director of the Lincoln Academy of Illinois, and I spent a little time with UIS student Clarissa Fisher, who is being honored this year as the UIS 2014 Lincoln Academy Student Laureate. This prestigious honor is bestowed every year by the Lincoln Academy of Illinois on one exceptional student from each university in the state to recognize their outstanding performance. Each student honored is presented with the Lincoln medal, a certificate and a $1,000 award. Besides being a UIS student, Clarissa is also employed at Bunn-O-Matic Corporation in Springfield, one of the city’s leading employers. She is also a generous volunteer who has given her time and talent to Habitat for Humanity, Big Brothers Big Sisters, and other organizations. Clarissa also has done mission work in Haiti and even spent a year in China teaching English and Art to young children. She is a great example of the UIS promise of Leadership Lived … and a reminder to us all to stretch ourselves and be the best we can be. 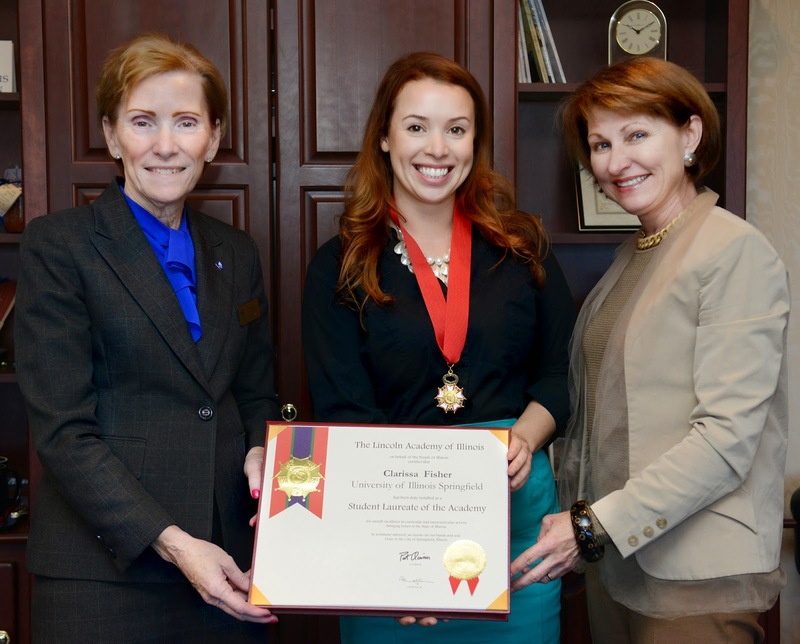 Congratulations, Clarissa Fisher on being named the 2014 UIS Lincoln Student Laureate! Congratulations to one of our best!